Seahawks Mailbag: Free agent rumors and rumblings — Could a few former Seahawks find their way back? Could Bruce Irvin be a good free agent fit for the Seahawks? Or maybe Golden Tate? Time for our latest Seahawks mailbag, focusing on some soon-to-be free agents whom Seattle may have interest in — all with ties to the Seahawks or to the area. U think Hawks can sign Bruce Irvin ? A: Bruce Irvin, Seattle’s first-round pick in 2012, is indeed again a free agent as the deal he signed with Atlanta after he was released by Oakland only went through the rest of the 2018 season. The Seahawks acknowledged at the time they wanted to bring Irvin back, but he decided to go to Atlanta, instead, to play in his native city. Irvin played well enough with the Falcons, with 3.5 sacks in eight games, all coming in a three-game period late in the year. Irvin told local reporters late in the season he hoped to stay with the Falcons but would consider all offers. He’ll be 32 next November so he’s maybe entering the stage of his career where he gets one-year offers, and is more of a second- or third-wave guy if he enters free agency. Seattle had interest late last season but that was also when the team was in a playoff push, had needs at the DE spot, and could see the value in signing someone who has experience in Seattle’s system. The approach may be a little different now. The Seahawks may go for vets at some spots, but ideally the big moves made in the offseason are ones that can help in the long-term. So we’ll see. Carroll generally shows little reluctance in bringing back former players. But if there’s a fit financially and otherwise with Irvin — and obviously if it’s an offer Irvin likes — then maybe it can happen. Danny Shelton will be a Free Agent. Do you think the Hawks take a look. A: Sure. I say that in part because I think they take a look at just about anybody who might make some sense, because you never know. But a flyer on Danny Shelton might make more sense than a lot of other things this offseason. Shelton obviously has local ties, playing at Auburn High and then at UW. His four-year rookie contract as a first-round pick in 2015 is now running out after this season with the Patriots, who acquired him in a trade with the Browns last spring. Shelton has drawn mixed reviews with the Patriots this year. He has played in 13 games and started against the Chargers in the divisional round. But he was inactive for Sunday’s conference title game win against the Chiefs and has played sparingly as the season has gone on — he had just seven snaps against the Chargers and was a healthy inactive from weeks 13-15. That lack of playing time might indicate he’s not really in the Patriots’ long-range plans — or at least, not a big priority. And that might make him easier for the Seahawks or another team to get him. The Seahawks can use some help at tackle with players who can either defend the run or rush the passer. Shamar Stephen will be a free agent and may not be back with Carroll hinting at the end of the year that Poona Ford could be ticketed for his starting spot alongside Jarran Reed. If Stephen doesn’t return, there’s room for a veteran to compete for that spot (and there is even if Stephen does return, but if he doesn’t then the urgency is even greater to add players at that spot). Shelton hasn’t fulfilled the potential that made him the 12th overall pick in the 2015 draft, to be sure. But he’s also only 25 and maybe coming home would help him achieve that breakthrough. Is there any way that Golden Tate would come back or afford him? A: The Seahawks, as noted earlier, are more than happy to bring back former players. But not sure I’m seeing this one. For one, Golden Tate has said his preference is to stay with the Eagles, and given that Philly traded a third-round pick for him, the Eagles be motivated to try to keep him (unless they think they’ll get a comp pick out of it). Tate also has thrived statistically outside of Seattle, making at least 10 more catches in every season since he left the Seahawks than he did in his best year in Seattle. He might prefer to stay with offenses that favor the pass more than Seattle does (you may have heard that there’s been some discussion of Seattle’s offensive philosophy since the end of the season). And, well, there have always been rumblings about how happy each side was with the other when Tate left via free agency in 2014, with Tate at one point calling Seattle’s offer “laughable.” Carroll did some damage control on that statement a few years later and said the Seahawks would have been happy to have Tate back. Seattle may indeed want to dip into the free agent waters to add a receiver. But setting aside anything to do with his history in Seattle and other such factors, Tate — who will be 31 in September and still in the prime of his career — figures to be too expensive if he’s really going to get anywhere close to the $10 million that Spotrac.com has listed as his potential value on the open market. Do the Seahawks still have an interest in re-signing Mychal Kendrick’s now that his sentencing hearing is in April? A: Yes. From my understanding, Seattle would still like to bring back Mychal Kendricks, assuming he will be available. But that’s the big “if” in all of this. As you note, the fact that his sentencing has been moved back from January to April complicates things. 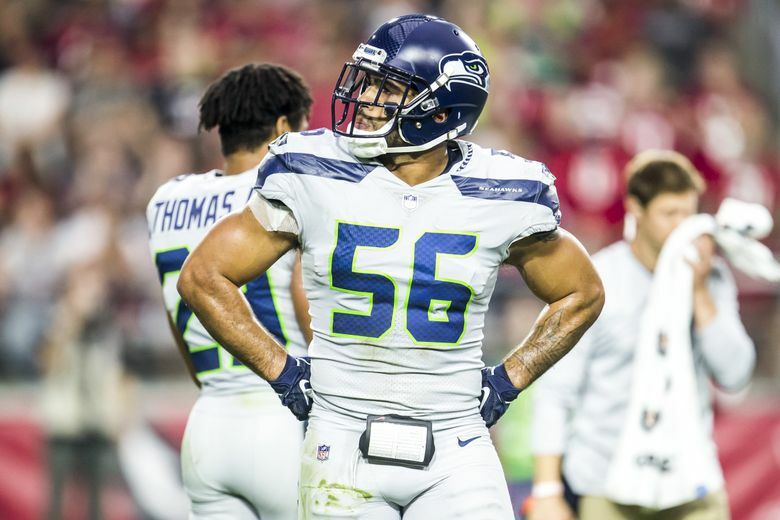 Seattle had ideally hoped to know before free agency if it would have Kendricks in 2019, which would allow the team to make other moves at linebacker. But now Seattle will apparently not know (I say apparently only as a hedge in case something happens and the sentencing is moved again or something) if Kendricks will be available as it enters the free agent period in March. I’m not sure that changes anything in regard to K.J. Wright, who I still think is more likely to be playing elsewhere next season than in Seattle. But it might change if Seattle doesn’t know whether it will have Kendricks. Certainly, the Seahawks will have to ensure they are covered in some way at weakside linebacker (I expect Austin Calitro, who will be an Exclusive Rights Free Agent, to return, and Shaquem Griffin remains in the mix). If the Seahawks re-sign Wright and bring back Calitro, that might be good enough for the Seahawks (who signed Kendricks after the injury to Wright). But if not, and if Kendricks is available to play in 2019, I think Seattle absolutely will be interested in bringing him back. Was Malik McDowell a wasted opportunity? A: Of course. Malik McDowell will go down as one of the worst picks in Seahawks history for all the obvious reasons, and the ripple effect of that is still being felt now — just think what the Seahawks’ defensive line could have looked like the past two years if McDowell had been what the team hoped, teaming with Frank Clark and Jarran Reed. At least the Seahawks moved down in the 2017 draft to get him at 35 instead of their initial spot at 26. Three different trades to move from 26 to 31, 34 and finally 35 netted Seattle four extra picks, three of whom were significant contributors this year and could be for seasons to come — Chris Carson, Tedric Thompson and Delano Hill. Seattle also took Mike Tyson with one of the picks it got in the trades it made to move down. So while taking a look at the bright side isn’t real easy in regard to anything involving McDowell and the Seahawks, that draft was far from a total loss.